The trees, shrubs, bushes and groundcovers between your home and the water are the lake’s last line of defense. This area is often called the buffer because it “buffers” the lake from excess nutrients, sediment and stormwater. It is also provides an essential habitat corridor for riparian animals. Whether you live on a lake, pond, river or stream this area is crucial for maintaining water quality. 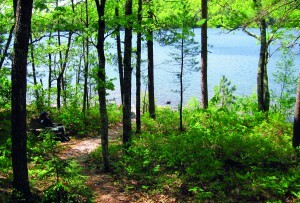 However, a view of the water is also important for most lakefront landowners. This is why shoreland zoning, which is designed to protect this area, has provisions to allow trees to be limbed up 1/3 of their height. Care was taken to leave the natural vegetation intact while allowing for a view on this waterfront lot. If all you have between your home and the lake is grass or trampled sandy soil, then consider planting a shrub border or “island” to help soak up rainwater. After picking up speed on your driveway or roof, stormwater needs a place to slow down and get absorbed back into the ground. Low-growing, native woody shrubs hold back the earth and take up much more water then grass or bare ground. Using the proper plants which are suited to the area can also be easier to maintain then a lawn. 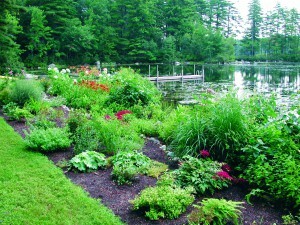 This beautiful waterfront planting (left) on Moose Pond included a variety of native ornamentals. For some planting recommendations see Go native! Eighty percent of all soils tested by the University of Maine Cooperative Extension in the last five years did not need the nutrient phosphorus to grow grass. 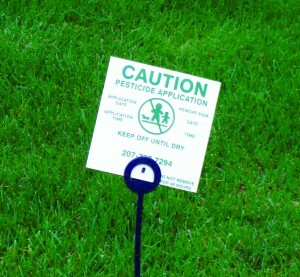 Still phosphorus laden lawn care products are routinely added to waterfront lawns. The use of lawn fertilizers in the last 15 years has skyrocketed and our lakes are paying the price. Topical fertilizers easily wash into the lake and encourage superficial root growth which makes grass more prone to drought. In addition to nutrients that harm both fresh and marine waters, lawn fertilizers are also often full of pesticides which are known to cause cancer. Is a green lawn worth that much? The safest way to a green and healthy lawn is by building up the soil. This can be done by adding good quality compost and natural fertilizers like alfalfa meal and corn gluten. Signs like this are a good indication that some lawn care products are not safe. 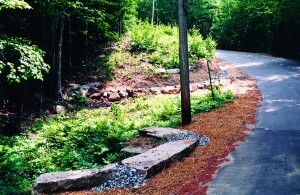 Lakefront driveways are one of the biggest culprits of erosion on residential lots. Having a home on the lake means that by necessity, you are at the bottom of the watershed and therefore water is coming your way. Erosion of your driveway is also erosion of your money. No matter what, roads and driveways always need some level of maintenance but if you are just adding gravel every couple of years and watching it slowly wash away then it is time to think about alternatives. Oftentimes a berm at the top of the driveway can force water off into woody areas which can absorb stormwater. Open-top culverts and rubber razors are an easy way to get water off the driveway for seasonal homes that don’t require plowing. Routine grading or raking can help keep a proper crown or pitch so that water runs to the side instead of down the whole length. 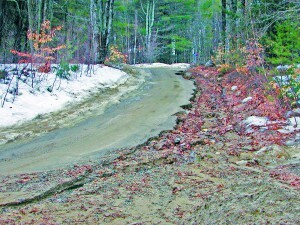 For more ideas, check out the Maine Camp Road Maintenance Manual. Severe erosion like this could have been prevented with a properly sized ditch. Paths are like little driveways except they run all the way down to the lake. They channelize stormwater and wash soil right down into the water. However, they are often a lot easier to fix than driveways. Waterbars made from logs or landscape timbers can push runoff into adjacent areas with vegetation. 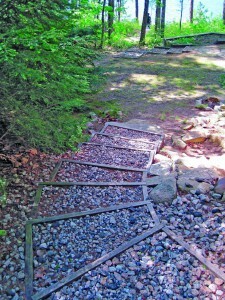 Steps back filled with crushed stone can stabilize the walking surface while providing infiltration. Infiltration steps like these on Foster Pond absorb rainwater and are stable even in heavy rains. 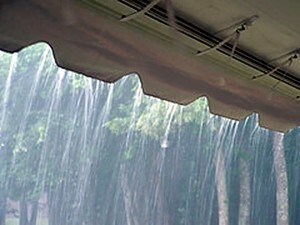 While water coming directly off the roof is relatively clean, it builds up enough volume and velocity to immediately erode the soil as soon as it touches the ground. Using dry wells, drip edge drains, rain gardens or rain barrels can alleviate erosion caused from roof runoff and reduce your homes overall environmental footprint. 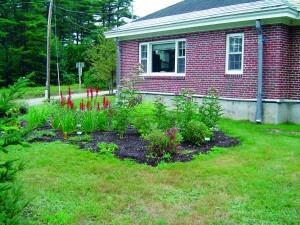 This rain garden at the Portland Water District’s Lake Office in Standish is an attractive way to treat roof runoff. Heavily used areas frequently have compacted soils and little capacity to absorb runoff. These spots are often devoid of vegetation and have exposed tree roots protruding from the soil. Stormwater builds up on these areas and has the ability to wash out natural vegetation, shorefront or beaches below. If you can’t plant or at a minimum get grass to grow, consider top dressing with superhumus or erosion control mulch. These products are primarily made from ground up stumps and bark and look similar to garden mulch but they are much less erosive. They not only slow down and absorb water but they also protect tree roots (and bare feet from tree roots). Always make sure not to cover existing plants when bringing in mulch and remember to contact the Code Enforcement Officer if you are planning on getting more than 10 cubic yards. Docks are an integral part or lakefront access but in the off season their storage can leave a swath of dead vegetation right along the water’s edge. The plants and shrubs in this area are too important to be smothered for 6 months and then spend the rest of the year trying to recover. 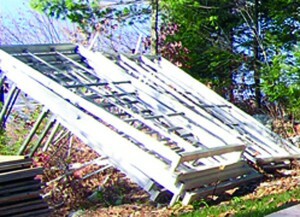 Storing your dock directly on your footpath or outside of the 100 foot buffer are the two best options. If these are not feasible because of the docks weight or size, consider upgrading to a different type. There are many dock systems available today that are both lightweight and portable. Although you don’t see your septic system, it is there and it is very important. It also requires maintenance to function properly. When septic tanks are not pumped regularly, sludge from the tank begins to flow out into the leach field which is designed primarily to percolate water. The sludge can clog the bed and cause the system to fail. Aside from being a threat to water quality, a failed system often means backed up pipes with no ability to drain water. Replacing a leach bed also requires a substantial amount of excavation and can be quite expensive. To avoid all these problems have your tank pumped every two to threeyears if you live year-round and every five years if you are up only seasonally. If you have a filter on your tank that prevents debris from entering your leach field this should be regularly hosed off too. This will help prevent your system from backing up at the outlet of the septic tank. 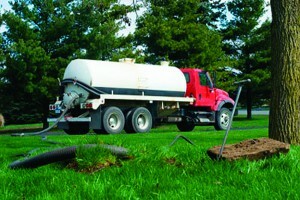 Pumping your septic tank regularly will extend the life of your leach bed and protect the lake. If you are not sure how your property is affecting the lake, grab an umbrella and raincoat and head outdoors during the next heavy downpour. This is the best time to really see what is happening with stormwater and how you could fix problems. Start at the top of the property and work downward towards the lake. Take note of where water is channelizing, where sheet flow is heavy and areas of vegetation that might be able to absorb some of the water. The key to treating stormwater is to break it up and divert water flow to stable areas as often as possible. Use some of the techniques above to get stormwater off driveways and paths. If there is already a ditch designed to hold stormwater, make sure it is stable by armoring it with rocks or vegetation. Natural tributaries and wet areas should be left alone. If you still have questions or would like help to evaluate your property, please contact Colin Holme, LEA assistant director, for a free Clean Lake Check-Up. Call 207-647-8580 or email colin@leamaine.org.